This small collection of artists, packed together on a 3″ by [walnut + locust] offers 6 tracks by different artists, many of whom you might have already heard on a release by the Canadian label. The appropriate title may hint about the nature of these tracks, being all a bit peculiar, each in its own way. Compiled together, they offer a wide array of sounds and moods for the listeners. The first track, by Subh, opens with a disturbing, yet subtle drone which slowly crawls and gains a massive presence. This opening gives way to Thisquietarmy and “Sunday Awakening”, diving even deeper into hypnotic sounds and heaviness. Rei Rea is the next artist on this intense album. “Sibio” sounds ceremonial and dense, not letting down anybody who has heard Rei Rea before and liked it. The sounds merge together to resemble ominous chanting and metallic footsteps which suddenly ends, only to lead to the next part of Strange Invaders. Mongst, enters with “Tube”, a vibrating, unsettling track. “Tube” has a strange nostalgic aura to its sounds, along with an almost hidden, yet potent electronic droning that can drive you mad. Being the great track that it is, “Tube” stands as a great middle point in this album, summing up the intense heaviness that crawled before it, while letting us know a little about what’s waiting after it, as something vague in its buildup resembles the next track. “Airport”, a collaboration between .cut and Botchan K, Takes the hints of chaos that were suggested on the previous track and amplify them over the drifting sounds of an airport. The resulting rhythmic noise, sewn together to a sporadic piano playing that sounds haunted and comical at the same time, creates the notion that something hostile is lurking in the shadows of the airport we are hearing in the background. At the last seconds we get the feeling that we are going to reveal the strange invader within these international walls, and as the curtain is about to be lifted around the mystery that was created by .cut and Botchan K, we are taken to the last track by Pier-Emmanuel Tremblay, with another impressive piano recordings, which emphasizes the peculiar characteristics of Tremblay’s music, which are cleverly hidden beneath the sheets of naïve sounding piano rolls. 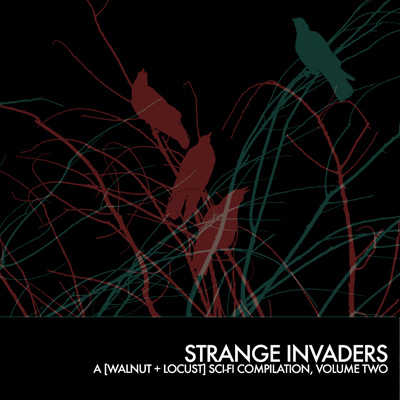 The compilations of [walnut + locust] successfully take into consideration the theme of the album along with the right artists and right music, and this album is no different. “Strange Invaders” is a well worth album with a strong buildup and not a single weak point, beginning with the dreadnaught by Subh, and ending with Tremblay’s energetic finale.